Another topic suggestion from Kathleen Duncan: What has been the most encouraging outcome you have seen in one of your cases? Pick a case you thought might never get better, but they did! What made the difference? After nearly 14 years in the counseling field, that’s a tough one. Since the newest memories are the freshest, I think I’ll tell you about a couple I just started seeing about a month ago. We’ll call them Dan and Fran. This is funny if you’re not fighting about who does what chores, or if, for instance, the husband objects to doing any houehold chores! This is a fairly young couple, both working at responsible jobs although not being paid as much as they’d like. I’m not going to go into detail about their issues. Let me just say that it was clear they had developed a habit of talking AT each other instead of WITH each other; that they had persistent habits in their efforts of communication that I have often referred to as “the crazy dance.” It’s as if someone had choreographed their statements and responses, and they had learned the routine so well that they just didn’t know how to break it. They’d been together for a long time, since high school. No children. Dogs they adore. A house that needs a LOT of work that they can’t always do without some professional help. He’s more laid-back; she’s more uptight. She’s ordered, he’s catch-as-catch can. In terms of personality, you have a strong choleric/melancholy (Fran) married to a strong sanguine/choleric (Dan). That’s a strong leader type, detail-oriented perfectionist with a happy, people-oriented leader who isn’t quite as strong as she is. He has no problem with missing a dish or two when he has kitchen duty. It drives her crazy when he doesn’t do the whole job. Are any of you recognizing yourselves? Most of us have this type of conflict to some degree. To complicate matters, she was struggling with some pretty severe depression. She had medication, but wasn’t faithfully taking it. So there were all the difficulties associated with depression. I shared with them that what they are experiencing is SO normal! I got them laughing with my own stories of fussing over different ways of folding the towels on putting the toilet paper on the spindle. How silly is it to fight over these things? They are not the hills you want to die on! They are so insignificant that the best way to deal with them is to laugh. 1. If either partner HAS to win ALL the time, the marriage is doomed. No one wants to be the one who HAS to lose. 2. You don’t have to attend every fight you’re invited to. 3. Not every disagreement needs to turn into an argument/fight. Sometimes, you can agree to disagree as long as neither partner is hurt by doing so. 4. You need to learn/develop the gift of forgiveness; you need to be able both to give it and receive it. 5. Humility goes a long way toward smoothing a rocky path. 6. Humor is a great aphrodisiac. 7. How you disagree isn’t as important as how you make up afterward. Mercy, kindness, forgiveness, and letting go are far more important than winning. Obviously, we’re just scratching the surface here. I could write on this topic for a long time. One thing I don’t want to leave out, though, is spirituality. I am a Christian, and my counseling is always strongly based on biblical principles and values. If the couple I’m working with share those beliefs, then of course we weave God’s Word throughout the whole process (One thing I never do, though, is start by preaching “wives, submit. . . .” There’s a right time and a wrong time for that. Something else I could spend a lot of time writing about.) The truth is that God created male and female, and He ordained marriage. He loves it. He told us how to do it. When I can use the Word, the counseling process is a joy. If I’m dealing with someone who objects to “religion” in their counseling, I can still teach biblically sound behaviors and ways of thinking. This couple is doing very well. They like Active Listening, which, when properly used, eliminates anger, debate, accusation and pain. They’re learning to separate the important from the unimportant. They laugh a lot in my office, which is a total delight to me. Believe me, it’s not always like that. Not at all. And those times, those couples, are enough to break my heart. Emotional abuse is very hard to prove. It is subtle, unrelenting, and lethal. It is always incorporated into verbal abuse. I hope that what you’re going to see as we continue these posts is that all forms of abuse are tied together. Sometimes, the abuser is just a lot more effective at one than he is at another. If your partner continuously degrades or belittles you, that is abuse. Even if he is not hitting you, it is abuse. Disrespect is abuse, There is no excuse for one partner disrespecting another. He controls all the money, all the time. You have to beg for anything extra. He’s an excellent blame-shifter. If he broke your favorite heirloom from your grandmother, it’s because you made him. Not his fault. Ever. He ridicules you if you complain about his treatment. He loves it if he can make you cry or go into a screaming rage. Shows you have no self-control. He shouts, criticizes, and calls you names. In public, he’s a charmer. No one would guess what goes on behind closed doors. He humiliates you in private. If that doesn’t work, he does it in public, managing to make you look like the one who started it. If nothing else works, he simply refuses to talk to you until you come begging him to forgive you. He can go much longer than you can without speaking. As a result of this kind of treatment, a woman begins to distrust herself. She sees spontaneous behavior as childish. She has a hard time caring about anything. She worries about every word she says, fearing it will be misinterpreted. She fears she may be losing her mind. She may spend time trying to figure out what she does wrong, hoping that if she can change, he’ll be nice to her. She has no self-confidence, but is full of self-doubt. She develops a lot of negative self-talk: “I’m so stupid, I’m so dumb, I’m so inadequate; no one could truly love me, I have nothing to offer, I embarrass him because I’m too fat/thin/ugly/old.” The list is endless. So, what’s a person to do when there seems to be no hope for change? The best advice I can give you is to stand up to the bully. A popular television psychologist has said that we teach people how to treat us. If you have accepted the abuse and tried to improve, then you have taught your abuser that he can continue to mistreat you. What do I mean by standing up to the bully? Simple. Most bullies are cowards. They pick on those who are smaller or in some way unable to defend themselves. Stand up. Refuse the bullying. Tell him you will no longer accept the abuse. Walk away if he begins to rant. Have your car keys in your hand, make sure you’re much closer to the door than he is, and GET OUT! If there are children, get into your car, lock it, and call the police on your cell phone if you believe they may be in any danger. You have to think ahead. You have to be willing to leave for a while to let him ponder this new woman in his house. I’m telling you that he won’t change if you don’t change. Often, when you stand up to a bully, he backs down. Bullying is all about power, control, and ego. Fight back. You’ll be glad you did. I know I’ve made this sound far more simple than it really is. At some point, I’m going to devote a whole post to ways you can fix an abusive relationship. Come back next week to learn what mental abuse is all about. A person who is constantly verbally abused in childhood often marries someone who will continue the abuse. Why? Well, because she believes it’s true, and that she deserves it. This is true of any form of abuse. One of the biggest lies we learn as children is that “sticks and stones may break my bones, but words will never hurt me.” Of course they do. I could fill this whole post with pictures of this nature. I hope you’re getting the point. Words do hurt. Sometimes, they can even kill. More than one person has taken his own life because he believed he was worthless; that there was no hope of his ever improving; that everyone who knew him hated him. As a teacher, I observed the pain that words and body language created for the children who weren’t quite acceptable. You know, the little girl from the poor family, who didn’t have the right clothes. The other little girls would turn their shoulders to her and whisper and giggle while she stood outside the circle, knowing she was being talked about. And I’m talking about very young kids here, kindergarten and first grade. It got a lot worse as they grew older! Fat. Skinny.Stupid. Ugly. Dumb. Clumsy. Retard. Dirty. Ragbag. Thunder thighs. Tank. The list is endless. What other children say is hurtful and ugly; what family members say is devastating. Col. 3:19. Husbands, love your wives, and do not be harsh with them. Psalm 34:18. The Lord is near to the brokenhearted and saves the crushed in spirit. Eph. 4:29. Let no corrupting talk come out of your mouths, but only such as is good for building up, as fits the occasion, that it may give grace to those who hear. Eph. 4:31. Let all bitterness and wrath and anger and clamor and slander be put away from you, along with all malice. So how do you know, in marriage, if you’re being verbally abused or if negative comments are truly meant to help you? Verbal abuse can be loud rants, quiet comments, obvious put-downs, or not-so-obvious remarks that undermine the partner. They can be said so that the offender can say, “Why are you being so touchy? I was just teasing!” Or, even more difficult to deal with, the ever-popular “Well, I didn’t mean it that way. You’re too sensitive.” What all the methods have in common is the need to control, to be superior, to avoid taking personal responsibility, and to mask or deny failures. Abusers of all sorts are incredibly expert at blame-shifting, making every offense the fault of the victim. Here’s a good barometer to know if what you’re experiencing is truly verbal abuse: You feel you just can’t win. You’re always wrong, he’s always right. He embarrasses you in public as well as private, and claims he was joking. He “doesn’t remember” saying anything hurtful. 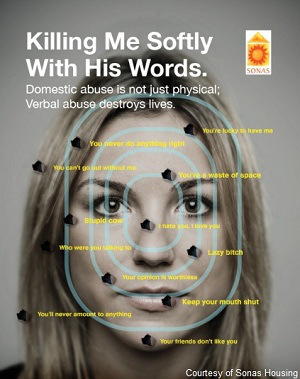 And finally, even if it has never happened, you worry that his verbal abuse will escalate into something physical. So. What can you do to help yourself? First, understand and accept that you cannot change him. It’s not your job to change him. If he isn’t violent, calmly inform him that you will no longer tolerate his abuse. Tell him that disrespect is abuse, and that you have felt abused since Day One, right after the “I now pronounce you husband and wife” part. Tell him you want him to get some counseling–pastoral, professional, peer, whatever you think he will agree to. Second, never try to match him verbally. His sarcasm is well-honed. He will win simply because he won’t quit until he does. You will leave that battle feeling worse than ever. It would be much wiser to tell him that you love him too much to hurt him with words, and then walk away. Third, it’s time to draw some boundaries and set some consequences.Next time he starts on you, calmly hold up your hand and say something like this: “John, I will no longer listen to your hurtful words. If you don’t stop, I will leave the conversation. If I have to, I will leave the room. If you push me to it, I will leave the house. Please treat me as your equal, which I am.” Note here that telling him you will walk away could be dangerous if he is also physically violent. In that case, don’t tell him. Just do it. Have your keys where you can grab them in a hurry. Make sure you are much closer to a door than he is. If there are children in the house, and he is escalating to physical violence, you may need to call the police from the safety of your car. Lock yourself in. Sit tight until help arrives. Fourth, there are other safety measures. If the verbal abuse becomes unbearable, it would be helpful for you to have a network of support from friends, family, church or coworkers that you can rely upon if you need a place to go. One tool all abusers use is to isolate their victims from everyone else, including and especially from their own families. Don’t let this happen to you. Make sure you have a cell phone (a cheap one is all you need). Also, start a bank account in your own name only so that you are not caught without finances if you have to leave. Finally, get counseling. If he won’t go, then go by yourself to learn how to cope with his abuse. And please, if he escalates to physical violence, get out of there RIGHT NOW! I am aware that there are some well-meaning religious leaders who will tell you that you just need to submit to your husband and pray, and everything will turn up sunshine and roses. I know about the passage in I Peter 3 that teaches women that they can win their unbelieving husbands by their pure and humble behavior without ever speaking a word to him. I believe that passage. However, I have a little trouble with the “just submit and pray” thing. Such a position seems to me to assume that the husband is all that he should be–and often, these abusive men are absolute charmers when they are not within the confines of their own homes. They save their ugly side just for you, and sometimes they will even taunt you that no one will believe you if you try to get help. The most troubling and confounding thing about all this is that so often the wife feels guilty and responsible, and that if she can just do better, he’ll be nicer. Nope. Won’t happen. Remember, this is all about power and control. Boundaries, consequences you can and will follow through on, and a deep realization that you are, as a believer, a daughter of the King of Kings! As such, behave like the princess you are and refuse to tolerate abuse for one more minute! I just met with a young couple who, for something new and different, are very much in love and came seeking my help to solve a dilemma in their marriage. It was so refreshing to talk with them, because they weren’t accusing each other; neither of them had a burning need to be RIGHT; both are kind in their speech and manners. The problem lies in their personality differences. He’s a slow processer. It takes him some time to figure things out, decide how he feels, what he thinks, what he’s willing to do. He’s a peacemaker, sometimes to his own detriment. We do teach people how to treat us. When we continually accept poor behavior, we’re teaching others that they can say or do anything they want and we’ll just take it. Not good. She, on the other hand, is an instant responder. She operates from a set of very strong ideas of what’s right and what’s wrong; she doesn’t tolerate mistreatment with very much grace at all; and she wants him to defend her when the need arises. Instantly, mind you. No stopping to think. So we talked it through; they each said what they needed to say. She felt he left her spinning in the wind. He felt she pushed him to do something he really didn’t want to do. This was a relatively easy session, and I was able to offer them suggestions that seemed to settle her down and brace him up. What were those suggestions? 2. She needs to love him enough to trust him to do what is best for her. That means she has complete freedom to tell him what she needs from him; she can express her strongest feelings to him, and she should. But then she needs to leave it in his hands. 3. He can tell her he needs to think about it for a day or two. He is not allowed to just forget it and let it slide. He should come back in a day or two and tell her what he thinks, and what he’s willing to do. 4. She, again, needs to love him enough to respect him and trust him to do the best thing. 5. They both need to forgive; each other, and those involved in the upset. She needs to forgive him for not defending her. He needs to forgive her for pushing him past his own desire to intervene. They both need to forgive the ones who helped create the problem. And that was my first session today. Nice and easy. So now I do a lot of marital counseling, and I thought maybe you’d enjoy reading some of the things I find myself saying a lot. 2. It’s more important to resolve than it is to be right. It’s more important to reconcile than it is to win. If you have to win all the time, you’re the biggest loser. 3. Your children are NOT the most important people in your lives. YOU are, you two who are married. When you believe that and act upon it, you give your kids the most incredibly stable, safe, and secure matrix for their own growth that you possibly can. 4. Of course, this should have been #1: God is the most important Person in your marriage. Never forget it. 5. Church is a great place to get preaching, teaching, fellowship, service, and a safe place to rear your kids. Find a good one. Stay there until it’s not a good one any more. There are probably others, but these are the main offenders. And I need to say here that God never approves of divorce, but He does allow it under certain circumstances which I choose not to discuss because I don’t want this to devolve into a controversy. I tell people, usually women, that you don’t have to divorce him, but you don’t have to live with him, either. The biblical injunction to respect one’s husband does NOT mean you have to accept being used as a punching bag or that you have to endure any other kind of abuse. If either partner indulges in any type of abuse, that’s a dealbreaker. And I could spend a lot more time here. Yes, I believe in Ephesians 5, and someday I’m going to write all about that. Not today. 7. Neither set of in-laws belongs in your marriage. Each partner is responsible to control his own parents. Never ever allow them to come between you. Ever. 8. After the first two years of marriage, money is the most common cause of divorce. Get help. Get financial counseling. Recognize your strengths and weaknesses and handle your finances accordingly. 9. Always function as a single unit in regard to issues with your kids. Don’t let them see any light between you–no cracks that they can weasel into and wedge you apart. If you disagree about something, do it privately, not in front of them. 11. You have to love each other on purpose. Love is a choice, and it will die if you don’t choose to keep it alive. 12. Date nights are important. And you’re not allowed to talk about money, in-laws, or kids on a date. 13. Rest is not just important; it’s vital. Sleep-deprived people can’t take care of themselves, each other, or their children. You probably need to de-stress your lives by letting something go. If nothing else, turn off your iPhone, your iPad, iPod, TV, TIVO, DVR, gaming device, and computer and TALK with each other. If you can’t think of anything to say, you know you need to disconnect from the electronics more often. If nothing else, play a game of UNO or something just to get some time away from external communication. Seriously. Take a walk. Take a drive. Take a break. God created marriage, so we know it’s good. He even gave us some instructions: The Song of Solomon; I Cor. 7; Eph. 5, and many other places in His Word are full of good advice about relationships. Enjoy marriage. Enjoy each other. Nothing is more satisfying, toward the later years of life, than to have built a solid, stable, longlasting relationship with the person who made your heart go all fluttery 45 or 50 years ago.